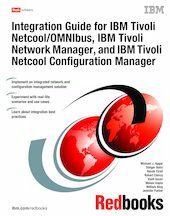 This IBM® Redbooks® publication covers the integration scenarios for IBM Tivoli® Network Manager, IBM Tivoli Netcool/OMNIbus, and IBM Tivoli Netcool® Configuration Manager. These three products working together provide a comprehensive solution for network and event management, and network configuration management, within the context of service availability and performance management. Tivoli Network Manager and Tivoli Netcool/OMNIbus are long established products in the IBM portfolio. Tivoli Netcool Configuration Manager (from the Intellident acquisition) is a new product in the portfolio and provides a comprehensive network configuration and change management solution and a policy-based network compliance solution for managing network devices in complex, rapidly changing environments. This book describes practical examples and use cases where these products work together to address network configuration management and event management requirements. IT architects and IT specialists working on integrating these Tivoli products in real life environments will benefit from this book.